LICT Corporation owns a collection of 14 geographically disparate rural telecom companies. The company traded on the AMEX as Lynch Interactive Corporation until 2006, when it underwent a reverse stock split and deregistered. Since, then the company has been diligent in releasing regular quarterly and annual reports for shareholders. Famed value investor Mario Gabelli and his associate, Salvatore Muoio, own 40.5% of the company. Nate Tobik at Oddball Stocks did a quality writeup on LICT earlier this year and ably summarized the key issues surrounding LICT’s valuation and investment potential. Essentially, LICT’s extremely low valuation is the result of investor skepticism. The wireline telecom industry is in inexorable decline. The question is not if wireline revenues will eventually slip below fixed costs, but when they will and how much cash can be harvested in the interim. LICT trades as if only a few more highly profitable years remain, but is that really the case? The company’s recent results suggest otherwise. 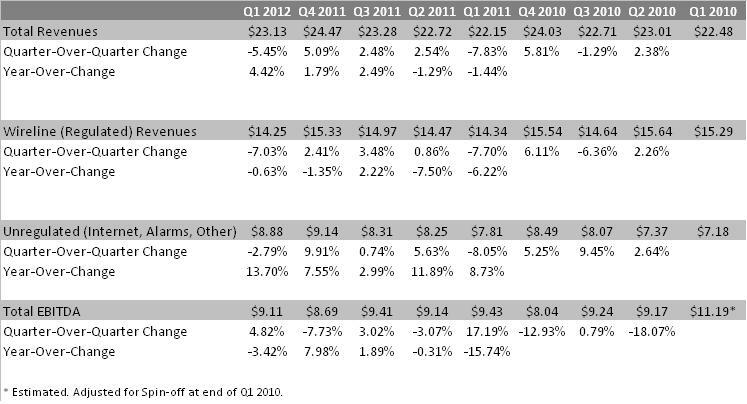 Wireline revenue is, as expected, declining. However, the rate of decline is slow and seems to have abated for now. Year over year, wireline revenue declined less than 1%. With its focus on rural areas, LICT is better situated than urban-focused telcos. Having grown up in very rural areas, I can attest to how few communications options are available for many residents, and how tightly many hold onto their land lines, even if they own cell phones. While wireline revenues are stagnant/in slow decline, LICT’s unregulated segment has performed well. Services like DSL and alarm systems have experienced steady growth. DSL is hardly the latest in internet access technology, but it’s the best available option for many. Verizon or Comcast are simply not going to make the investment necessary to provide FIOS or comparable services to remote communities. With total revenue seemingly having bottomed and even resumed growing, it is possible that LICT’s EBITDA figures have stabilized as well. In fact, twelve month trailing EBITDA of $36.37 million did grow by 0.86% year-over-year. Despite these encouraging signs, LICT’s valuation has declined continually over the past several quarters. Since the first quarter of fiscal 2010, LICT’s market capitalization has declined by 17.1% to $49.33 million. Simultaneously, the company cut its net debt by 29.9%, leading total enterprise value to decline by 25.2% over the same period. Trailing annual EBITDA declined by only 11.1% during this period. LICT now trades at its lowest valuation in at least two years, at 3.35 times EBITDA and at a 25.3% free cash flow yield. So what gives? Investors clearly are taking a dim view of LICT’s future despite encouraging recent results. I see two main scenarios that could unfold. 1. The market is correct. Rural customers accelerate their “wire-cutting” and LICT’s future EBITDA declines at an increasing pace. Furthermore, federal subsidies which support LICT’s business operations in rural areas are reduced or eliminated, further impairing LICT’s profits. In this scenario, LICT may be worth only its current EBITDA multiple, or even less. 2. The market is wrong. Investors have failed to notice or correctly credit LICT for its recent revenue and EBITDA stabilization, or the company’s success in reducing net debt and shares outstanding. LICT’s EBITDA, revenue and earnings stabilize, or show modest increases. The company is able to devote its substantial free cash flow to continued debt reduction, or toward acquisitions or payments to shareholders. In this scenario, LICT’s equity is tremendously undervalued. I view the second scenario as quite a bit more likely, and I expect the market to gradually realize LICT’s potential. If the company’s stock were to trade up to even a still-depressed 4.0x EBITDA multiple, it would be worth $3,113 per share, a 48% increase from current levels. A 5.0x multiple would mean a price per share of $4,661, 122% higher than at present. Even if the market never comes to reassess LICT’s valuation, Mr. Gabelli still has avenues available to reward shareholders (the largest of which is himself). At some point, a continually decreasing debt load invites the possibility of a leveraged recapitalization with a large special dividend for shareholders. For instance, increasing debt by $20 million would take the company back to its fiscal position in Q1 2011 when trailing EBITDA was slightly lower than it is today, and could fund an $851/share special dividend. While LICT Corporation faces risks of obsolescence and a resumption of revenue and cash flow declines, its historically low valuation may tilt the odds in investors’ favor at these levels. Disclosure: No position, may initiate. Good to see someone come to the same conclusions. LICT as a stock is somewhere between paint drying and grass growing, but as an investment it’s a pleasing compounder: moderately greater worth concentrated in moderately fewer shares each year. They’ve provided good value via spinoffs (CIBY especially) and have stated in their quarterlies that they’re looking to refinance and simplify their capital structure with an eye to unlocking more value. Gabelli and Dolan are pretty heavy hitters for such a small company, and while of course a thinly-traded OTC security is never a good place for minority shareholder rights, they’ve done little so far to make us suspicious. I am surprised that you did not include LICT in your year-end update. The company has continued to pay down debt and repurchase shares, yet the valuation has not changed. I thought you were very bullish on this company? You even mentioned them in your CIBL article. What are your thoughts on LICT’s current valuation? I suspect LICT is filing late this year because of all the wheeling and dealing the company is undertaking. Just today they announced a new credit facility that will give them a lot more leeway to invest as they see fit. I comprehend this is a hero among the most basic data for me. What’s more, I’m enabled examining your article. Notwithstanding, should comment on some wide things, the site style is perfect; the articles are extraordinary. A commitment of gratefulness is all together for the ton of liberal and reachable help.